My absolute favorite dairy dish of all time is Eggplant Parmesan. Breaded fried eggplant slices layered with homemade sauce and tons of mozzarella cheese, it’s the stuff of dairy dreams. Whenever I make it for an event it is the first thing people run to -but, let’s face it, it’s not the healthiest dish and honestly it takes a long time to fry all that eggplant. Enter the Deconstructed Egg Parm Salad- everything you love about Eggplant Parmesan but in salad form. I dreamed this baby up a few weeks ago and knew I wanted to make it and perfect it in time for the 9 days. 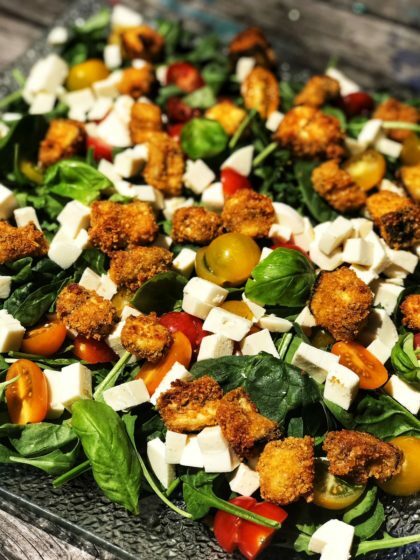 A base of spinach and/or arugula, tomatoes, fresh mozzarella, topped with Parmesan crusted eggplant “croutons” and drizzled with a roasted tomato vinaigrette which is basically like marinara in salad dressing form. It’s good. It’s real good. Best part is you don’t have to fry the eggplant- the cubes are coated and then baked to crispy perfection. Did I mention that it’s gluten free? And delicious? You’re definitely going to want to try this one. Let me know when you do! Enjoy! Preheat your oven to 425 degrees. Place the quartered tomatoes and garlic on a sheet pan, drizzle with olive oil ad season with salt and pepper. Roast for about 20-25 minutes or until the tomatoes are wrinkly and a little charred. Set aside to cool. Once cool, add them to a food processor with the basil, vinegar, and honey. Pulse a few times to break down the basil and then add the olive oil. Blend until it comes together. Season with salt, pepper and chili flakes to taste. Preheat your oven to 450. Line a baking sheet with parchment paper and spray well with cooking spray. Meanwhile, sprinkle some salt on the eggplant cubes and place in a colander for about 20 minutes. This will remove any bitterness and also remove excess liquid to help the eggplant crisp up better in the oven. Pat the eggplant dry with paper towels and then assemble your breading station. Mix the corn flake crumbs with the Parmesan and season with pepper, garlic powder and a little salt. Season the beaten eggs the same way. Bread the eggplant cubes by dipping them first in egg and then in the crumb mixture and place on the baking sheet. Leave a small amount of space between each cube so they get crispy. Once all the cubes are coated spray the top of all the cubes with cooking spray and place in the oven. Bake for about 25 minutes or until they are all crispy. Place the spinach/arugula at the base of a large, shallow platter. top with the cherry tomatoes and mozzarella and then place the eggplant croutons on top. Drizzle with the vinaigrette and garnish with the sliced basil. Here’s a link to one of my more recent recipes: Deconstructed Eggplant Parmesan Salad. 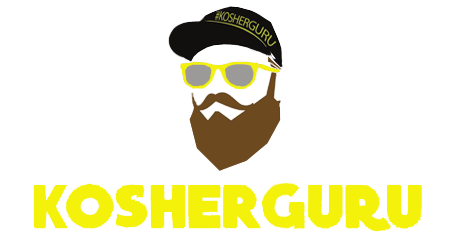 I am Fagie Reves, behind the blog, The Gush Gourmet. I am a full time caterer, mom, and wife living in the beautiful hills of Gush Etzion, Israel. From the age of 10, I spent my free time in the kitchen watching my mother cook her famous dishes. She didn’t often let me help, but what I picked up (besides for some secret recipes) was a passion for showing love through food. Cooking with love and then feeding people with the fruit of that labor is a gift. Though my career took a different turn for a while, I always spent my free time cooking, from working summers in one of NY top kosher restaurants to interning with caterers. Eventually my love of cooking, food, and feeding could not be suppressed and I made it my full time job. Now, I cater people’s smachot and holiday meals and get not only to provide them with delicious food but to share the joy of their occasions. What do I do when I have a day off from cooking? I cook! I Develop recipes and try to bring to fruition the ideas I dream up, and it’s a blast! You can follow me on Instagram @TheGushGourmet and Facebook @TheGushGourmet and find lots of those great recipes on my blog TheGushGourmet.blogspot.com.